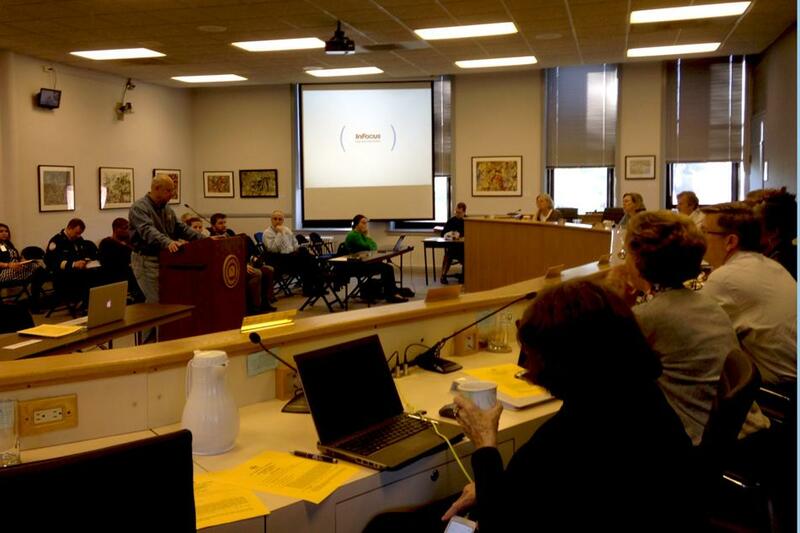 Resident Mike Vasilko speaks to City Council on Saturday about his thoughts regarding the proposed 2015 budget. Council held the special meeting to listen to the public's concerns about the breakdown in funding. City Council and staff held a public hearing on the 2015 budget Saturday to address resident concerns and further explain the proposed plan. During the special meeting at the Civic Center, city officials gave residents an update on infrastructure improvements and the details of a proposed capital improvement plan. Aldermen also introduced plans to implement various tax levies. Two ordinances would levy a property tax on funding for the Evanston Public Library and the activities of nonprofit organization Downtown Evanston. The third ordinance will levy a tax for the city’s general operations and general assistance funds, the Illinois Municipal Retirement Fund and the Police and Fire Pension Funds. Residents spoke both in favor and against the levy for the annual property tax for EPL, which would increase the funding given to the library in 2015. “It is deplorable that an institution that serves a diverse community so well must suffer such financial distress,” resident Deborah Abbott Kisor said. Kisor compared Evanston’s property taxes to the higher property taxes in neighboring cities, such as Skokie and Oak Park, Illinois. The library is requesting $7 per $100,000 of tax value, Kisor said. However, some residents raised concerns over the levy. “They just don’t have any urgent needs that the library needs to extend the tax rate for,” resident Mike Vasilko said. Vasilko said he thought the surplus money from the 2014 budget should be given back to taxpayers, but city manager Wally Bobkiewicz said the leftover funding is being used to pay off the city’s debt. Aldermen voted 6-1 to pass the introduction of the library tax levy ordinance with Ald. Ann Rainey (8th) dissenting. Council voted unanimously to introduce the other proposed ordinances. City officials presented the proposed capital improvement plan, which has a budget of more than $43 million. The funding will go toward projects to improve streets, water systems, sewage lines, parks, facilities, streets, alleys and sidewalks. The city is on target to finish all the construction projects from 2014, said Sat Nagar, a city engineer and the assistant director of Public Works. The rest of the projects that need to be completed will be done within the next two weeks or so, he said. However, longer term projects will carry over to next year, he said.